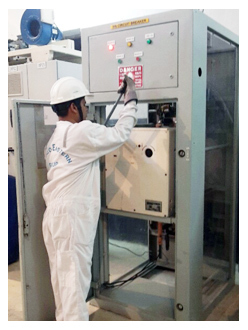 Course involves extensive practicals on High Voltage Switchboard and field visit to a High Voltage Generation Plant. Entry Criteria: Existing Electrical Officers, Existing ETO with at least ETO having at least 12 months of sailing experience and MEO Class 1, MEO Class 2, MEO Class 3 & MEO Class 4 CoC holders. The demand for electrical power has increased on many ships, especially those with diesel-electric propulsion where the supply current becomes too high. The supply current becomes far too high and it is not efficient or practical to use the common shipboard voltage supply of 440V. Modern ships, particularly container, passenger, LNG and specialised offshore ships are built now with high voltage generating plants of 3.3kV, 6.6kV and IIkV. STCW classifies High Voltage as 1000V and above. 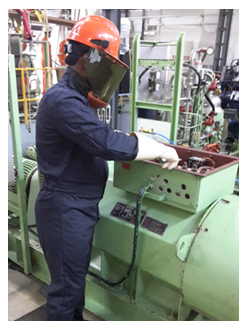 As per STCW Regulation III/2, - Chief and Second Engineer Officers and Regulation III/6 - Electro-technical officers are to be trained to work with high voltage installations onboard merchant ships. This course is designed to educate and train Management Level Officers and Electrical Officers on high voltage systems. Satisfy the requirements of STCW 2010 and reach a higher competence level in safety awareness and technical competence. To increase knowledge levels on various standards pertaining to safe working practices on High voltage systems. Work on various specialized components and equipment used in high voltage installations. Operate, maintain and troubleshoot high voltage installations safely and efficiently. Understand and eliminate accident probability on high voltage systems. Understand system layout and distribution arrangements. Know the procedure of issuing permits and sanctions to test, etc.. Copies of Passport, CDC, INDOS No.